The tenor ukulele is gathering an increasing number of fans. More and more people are gravitating toward tenor ukuleles because of their deeper and fuller sound. After all, the larger the instrument, the bigger the sound. The size of the tenor ukulele may also be a better fit for some. Although at face value there doesn’t seem to be much difference in size among the different types of ukuleles, it does matter when you actually have it in your hands. And tenor ukuleles are preferred by many who find the concert and soprano too small. In fact, many musicians are now favoring the tenor for live performances. This may also be due to the longer neck that gives greater range to tenor ukuleles. The tenor ukulele can also have greater sound diversity. While a tenor can be set up the same as a soprano or concert with a high-G string, you also have the option of using a low-G string which can add a different sound. But what is the best tenor ukulele? Just about every one of the best ukulele ﻿brands have several models, and wading through all the options can be overwhelming. In this article, we review the top tenor ukuleles to help you pick the best one for you. I’ve said this time and again: no list will be complete without mention of a Kala ukulele. This brand has become synonymous with the ukulele, and they offer a wide range of styles and prices so that anyone should be able to find a ukulele that will suit their needs. The Kala Koa Tenor Gloss ukulele (or Kala KA-KTG) is a gorgeous instrument. Made with Hawaiian Koa coming from the Big Island itself, each tonewood is hand-selected to ensure only the best quality. The KA-KTG sounds full and bright, and still retains some of that twangy quality that is expected of a ukulele. Guitar fans should definitely be able to recognize this brand. From the makers of the Stratocaster and the Telecaster, we now have the Montecito Koa Tenor. It has an all-Koa body decorated with a gorgeous acrylic abalone binding and rosette. It also sports the iconic Telecaster headstock shape which gives it an appearance unique to any other ukulele. 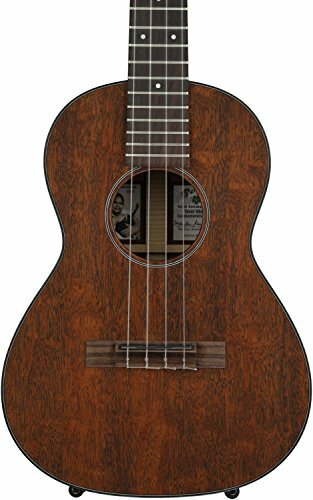 As the name suggests, the Montecito Koa Tenor has a lovely and warm sound quality, with good intonation and great sustain. If you want a great-sounding tenor ukulele that will stand out in a crowd, the Fender Montectio is the one for you. For those looking for a budget-friendly option that still offers great quality, the Cordoba 20TM may just be the one you’re looking for. The body is a rich mahogany with an elegant natural wood pattern rosette and done with a satin finish. The construction is solid and well done all around, as you would expect from Cordoba. This ukulele is surprisingly loud, more so than your standard tenor ukulele, and it has that bright Hawaiian sound. The mahogany gives it a very warm and rich tone that has a lot of personality. With its great sound and quality construction, the Cordoba 20TM is definitely one of the best tenor ukuleles. The Cordoba 30 series of ukuleles was created in collaboration with Pepe Romero Jr., world famous luthier. Built from a classical guitar builder’s perspective, the Cordoba 30T uses the “Spanish Heel.” Instead of joining the ukulele’s body and neck with a traditional dovetail joint, it has an integrated neck joint that creates a lighter ukulele with more stability. This hinders any movement that may occur as your ukulele ages, so your ukulele will keep its great sound for years and years. The 30T also features a deeper, wider body and a wider fingerboard, which makes it easier to play for people with larger hands. Featuring solid mahogany construction and a lovely abalone rosette, the 30T is sure to turn heads with its looks as well as its sound. Famously known for their steel-string acoustic guitars, C.F. Martin & Company’s 1T IZ Tenor Ukulele is their tribute to beloved Hawaiian musician Israel “Iz” Kamakawiwo’ole, and was designed in collaboration with his wife, Marlene Kamakawiwo’ole. Her signature graces the inside label of each uke. The Martin 1T IZ features a solid quilted mahogany body and a headplate made of east Indian rosewood. The headplate itself is adorned with a hibiscus flower done in pink awabi pearl and an “IZ” in Hawaiian koa. Looks aside, this ukulele also has a great tone. Overall, the Martin 1T is a lovely way to honor the man who sparked worldwide interest in the ukulele and Hawaiian music. If you’re looking to expand your playing beyond what you can do with the smaller soprano or concert ukuleles, a good tenor ukulele offers a deeper sound, greater range, and more versatility. 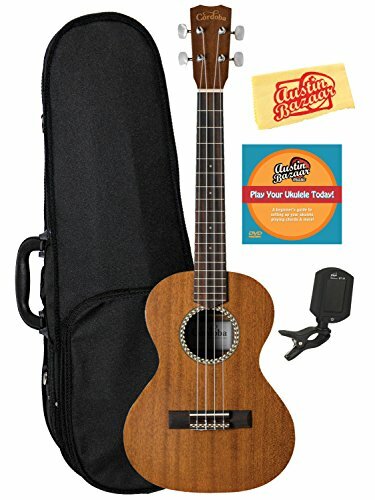 Or if you have bigger hands, are coming from the guitar, or have difficulty with smaller-bodied instruments, a tenor uke can be a great way to start playing the ukulele. Any of the tenor ukuleles on this list would be a fun addition to your ukulele collection, or a good first instrument. Now get out there and play the ukulele! Cordoba is a amazing great quality Ukulele and sounds really good. I have this Martin 1T IZ Tenor Ukulele the finger board is very smooth and very comfortable to play. Very happy to see this ukulele review in your site. Keep it up! !